A young Adenium multiflorum seedling showing off its first flowers. 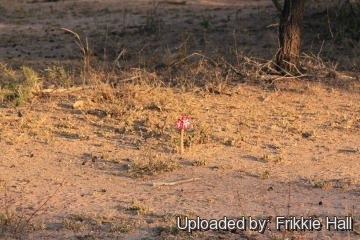 This cluster of seedlings were photographed near a parent plant in the Kruger National Park. Origin and Habitat: Adenium multiflorum is widespread in Zimbabwe, Mozambique, Malawi, south-eastern Zambia, north-eastern South Africa (Transvaal, Natal) and Swaziland. Altitude range: 0–700(1.200) metres above sea level. Habitat and ecology: This species grows at low altitudes in savanna and occasionally open forest, in hot dry areas in sandy places along marshes and rivers, and on brackish flats or rocky habitats. It flowers in winter when most of the surrounding vegetation is rather dull. It is threatened by collection for horticulture, medicinal uses and by heavy browsing by livestock. Where browsed extensively they tend to be small and shrubby. In protected areas, however, they can become handsome trees. In the Zimbabwe lowveld south of Mutare there is an old specimen that measus 7 m around the base. Flowering in habitat occurs between May and December. 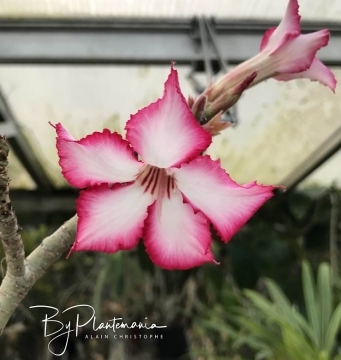 Description: The impala lily (Adenium multiflorum) is a succulent shrub or shrubby tree, 0.5–3.5 m high, the shape resembling a dwarf baobab. Stems arise from a large thickened carrot-like rootstock (caudex), up to 1 m in diameter at stem base that enables it to survive long periods without water. The flowers cover these plants when they are in full bloom, they vary greatly in colour, usually with pointed white lobes, crinkly red margins and red stripes in the throat. Plants with pure white flowers are occasionally found. The plant is leafless when in flower. For most of the year the plants do not have flowers or leaves. In the Kruger National Park some exceptional specimens can be seen. Derivation of specific name: The Latin specific epithet refers to the multitude of flowers produced by this plant. Stems: The branches are succulent, stout, glabrous except at the very tips when young. The bark is shiny, grey with poisonous watery latex. Leaves: The leaves usually appear after the flowers and are arranged spirally, clustered at end of branchlets, simple and subsessile. The stipules are minute or absent. The blade is 1.5–3(5.5) times as long as wide, (3.5-)5-8(-12.5) cm long, (14-)18-30(-76) mm broad, obovate ( broader towards the tip) to oblong, base wedge-shaped, apex subacute or obtuse, apiculate or mucronate, entire, leathery, shiny green above and pale below, glabrous on both sides. Midrib rather thin. Secondary veins faint, though usually distinct, very oblique; petiole 2-7 mm long. Inflorescence ( a dense terminal cyme): Much contracted, 5–15-flowered, terminal, sessile, preceded by more or less numerous deciduous triangular indurated bud-scales, hairy. Bracts lanceolate, 4-6 mm long. Pedicels up to 4 long densely hairy. Flowers: Bisexual, regular, 5-parted, showy, white, pink, crimson, red and bicoloured flowers usually appearing before the leaves, each flower 50-70 mm in diameter. Calyx 6-8 mm long, hairy. Sepals narrowly ovate 6–10 x 2.5–3 mm hairy, fused at base. Corolla red, pink or white, conspicuously cuspidate in bud. Tube funnel-shaped 2–4 times as long as the calyx (22-40 mm long), pink to white, red-striped within the throat, infrastaminal part of the tube, with 5 hairy lines descending almost to the middle, glabrous below, suprastaminal part funnel-shaped, villous within 10-13 cm across; throat-scales small, confluent and forming an obversely triangular pocket. Lobes spreading 13–29 x 10–19 mm, broad ovate to narrowly obovate, mucronate to apiculate, and crispate, pink to white with deep pink to scarlet margins, outside sparsely and minutely pubescent, glabrous inside. Lobes., narrowly ovate to narrowly obovate with a velutinous scale at the base. Stamens dstamens inserted near base of corolla tube and d istinctly exserted. Anthers 6 mm long, densely villous. Pistil 10–15 mm. long; ovary glabrous; style 8–11 mm long. The flowers are sweetly scented. Fruits ( paired follicles): Reflexed, cylindrical to spindle-shaped, pale grey to pale grey-brown, glabrous or very minutely tomentose, 7–18(-24) cm long 0.8–1.5 cm in diameter, eventually spreading at 180°, splitting open by a longitudinal slit, many-seeded. Seeds: Linear,10-15 mm long, coma (tufts of long hairs) dirty white to light brown, to 30 mm long. 1) Codd, L.E. 1963. “Apocynaceae. Flora of southern Africa 26”. Botanical Research Institute, Pretoria. 2) Court, D. 2000. 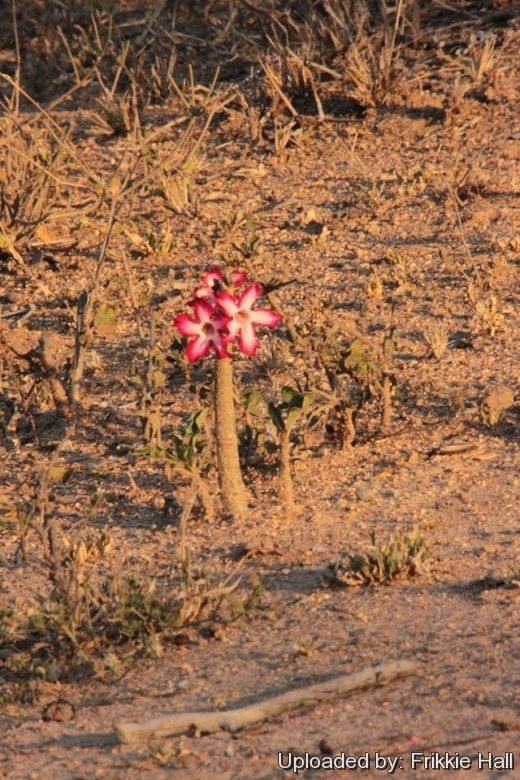 “Succulent flora of southern Africa”, revised edn. Balkema, Rotterdam. 3) Dimmit, M.A. 2000. “Adenium culture in hot climates or greenhouses”. Asklepios 81: 11-19. 4) Dimmit, M.A. & Hanson, C. 1991. “The genus Adenium in cultivation”. Part 1: A. obesum and A. multiflorum. Cactus and Succulent Journal (US) 63: 223-226. 6) Germishuizen, G. & Fabian, A. 1997. “Wildflowers of northern South Africa”. Fernwood Press, Vlaeberg, Cape Town. 7) Golding, J. (ed.). 2002. “Southern African plant Red Data Lists”. Southern African Botanical Diversity Network Report No. 14. SABONET, Pretoria. 9) Onderstall, J. 1984. “Transvaal lowveld and escarpment including the Kruger National Park. South African” Wild Flower Guide 4. Botanical Society of South Africa, Cape Town. 11) Palmer, E. & Pitman, N. 1972. “Trees of southern Africa”, vol. 3. Struik, Cape Town. 12) Pienaar. K. 1992. “The South African What flower is that?” Struik, Cape Town. 13) Plaizier, A.C. 1980. “A revision of Adenium Roem. & Schult. and of Diplorhynchus Welw. ex Fic. & Hiern (Apocynaceae)”. Mededelingen Landbouwhogeschool, Wageningen, Netherlands 80,12: 1-40. 14) Rowley, G. 1999. 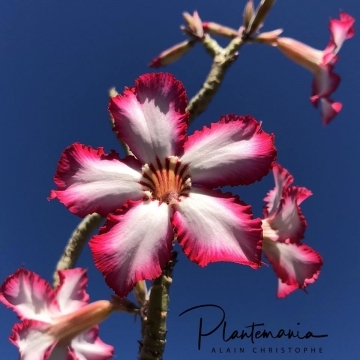 “The Cactus File Handbook 5: Pachypodium and Adenium”. Nuffield Press, Oxford. 18) Van der Spuy, U. 1971. “South African shrubs and trees for the garden”. Hugh Keartland, Johannesburg. 19) Van Wyk, B. & Van Wyk, P. 1997. “Field guide to trees of southern Africa”. Struik, Cape Town. 20) Van Wyk, B.-E. & Gericke, N. 2000. “People's plants: a guide to useful plants of southern Africa.” Briza Publications, Pretoria. 21) Van Wyk, B.-E., Van Heerden, F. & Van Oudtshoorn, B. 2002. “Poisonous plants of South Africa.” Briza Publications, Pretoria. Cultivation and Propagation: Originally from arid to semi-arid regions, Adenium multifloncm is among the most decorative of all succulents, and is highly prized in tropical or semi-tropical areas. It has long dormancy; regardless of growing conditions, leaves fall at the start of the winter and new growth begins in spring. It flowers profusely during the cool season. Leaves appear only after flowering. Outdoors it thrives on a xeric watering regime as required by cacti. Under ideal conditions, it can live for hundreds of years. Plants rarely flower before they are 4-5 years old. Uses: They are ideal subjects for a dry rockery, giving a warm colourful display of bright flowers in winter. As container plants they may be kept in cooler places, but do not water them when they are dormant and protect the plants against frost. Traditional uses: Adenium multifloncm is known in Africa and southern Africa as a source of fish poison and arrow poison. The poison is prepared from latex in the bark and fleshy parts of the trunk, but it is always used in combination with other poisons. Leaves and flowers are poisonous to goats and cattle, but the plants are sometimes heavily browsed and are not considered to be of much toxicological significance. Despite the toxicity, it is used in medicinal applications and in magic potions. Bonsai: Adenium multifloncm is suitable for most bonsai styles, it is a relatively fast grower: a seedling can develop into a rewarding bonsai in as little as ﬁve years. Many specimens develop interesting large, twisted bases and roots. Branches can be wired and growing tips pruned or pinched to encourage branching and compact. Keeping a plant root-bound is one method of achieving a bonsai plant. After the first 3 year’s of the plant’s life, raise the plant at each re-potting, exposing more and more of the underground caudex and roots. Propagation: Adenium multiflorum is propagated by seed, grafting or cuttings. Seeds are placed on the surface of the soil mixture for germination. Seeds germinate easily in about a week at 30°C, and seedlings grow without any special attention and grow through the first cool and dry period be-fore obligate dormancy appears. After the first, year, the plants should be kept dry during dormancy, to prevent the brittle root from rotting. Seedlings are also grown as the rootstock for grafted plants. The numerous hybrids are propagated mainly by grafting on to seedling rootstock. While plants grown from seed are more likely to have the swollen caudex at a young age, with time many cutting-grown plants cannot be distinguished from seedlings. Propagation by cutting is also possible, cut end shoots, dip in a rooting hormone, and let dry for a day or two. Be careful of the toxic sap. Stick shoots into a pot of coarse rooting medium, and provide bottom heat. Keep soil moist. The best time for either method is in the spring.